Operation of a fitness club; conducting fitness classes; operation of a racquet club, namely tennis, squash and racquetball; operation of an aquatics facility. Personal training services. Operation of an indoor golf facility. Operation of summer sports camps. 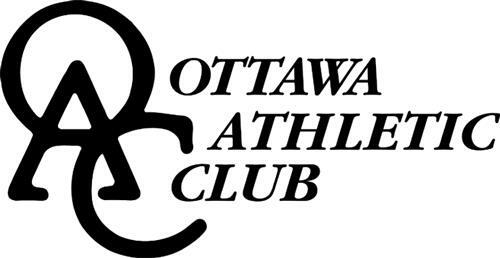 On Tuesday, December 9, 2008, a canadian trademark registration was filed for the above pictured logo by Ottawa Athletic Club Inc. 2525 Lancaster Road, Ottawa, ONTARIO, CANADA K1B4L5. The Canadian IP office has given the trademark application number of 1421086. The current status of this trademark filing is Registration published. The correspondent listed for is MBM INTELLECTUAL PROPERTY LAW of 275 SLATER STREET, 14TH FLOOR, OTTAWA, ONTARIO, CANADA K1P5H9 The trademark is filed in the description of Operation of a fitness club; conducting fitness classes; operation of a racquet club, namely tennis, squash and racquetball; operation of an aquatics facility. , Personal training services. , Operation of an indoor golf facility. , Operation of summer sports camps. .
(1) - Operation of a fitness club; conducting fitness classes; operation of a racquet club, namely tennis, squash and racquetball; operation of an aquatics facility. (2) - Personal training services. (3) - Operation of an indoor golf facility. (4) - Operation of summer sports camps.